I left my bike at home this past weekend when I went to New York City to watch E. run the marathon. Last time she ran a big race, I took Brompty and leapfrogged her for the entire course of the Brooklyn Half Marathon, and I got to ride the race route all by myself, without cars, and it was magical. I mean, how often do you get to ride on the streets–much less the streets of a major city–and never even have to think about cars? The NYC Marathon is a different beast, though, and I was expecting huge crowds–a million people line the route–and I didn’t want to get boxed out because I was carrying a bicycle with me. If you know me, you know how hard it is for me to travel without a bicycle, but alas, the priority was really to watch my sister complete this truly epic event, and I got to do that. It was all about the subway on Sunday, and the tears, because everyone who runs the marathon has a story of deciding to do this thing that really shouldn’t be done, and they’ve got their training plans and their injuries, and their best laid plans and their cheer sections, and it all happens, 50,000 times over. It was so cool to watch, and when she ran up to me around mile 21.5, hands in fists raised in the air, almost weeping as she said, “I’m doing it! I’m doing it!” well, I was pretty much cooked. Best ever. And then it was time for a few more subway rides back to the train back home, up first thing in the morning to head to work. I got to take my bike, and as soon as I was on there and pedaling, I remembered that how good it is to be home. That was four days off the bike, way, way too long. Next year I’m definitely taking my bike to the marathon, crowds be damned. I met my meetings, taught my classes, and then it was time to head home. It’s dark now, and that’s a whole different experience of riding, one that makes me feel like I’m alone on the roads. When cooler, darker weather sets in, lots of cyclists pack in their bikes for the seasons, and everything just feels quieter and lonelier, in a way I really like. 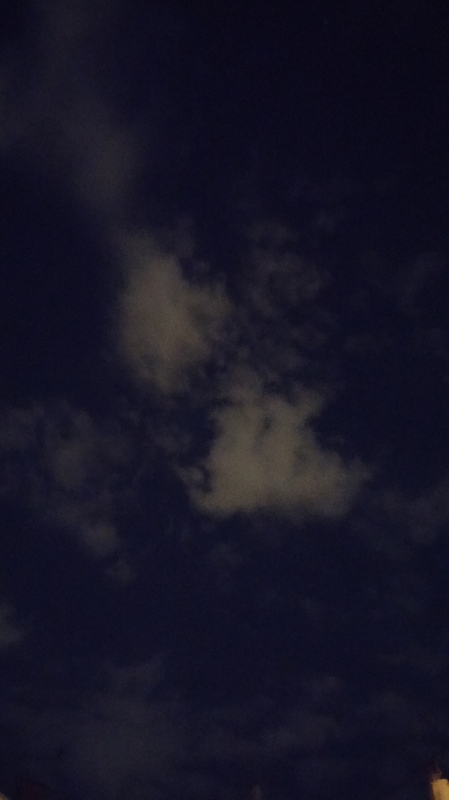 Just me, the bike, and this dark sky with the pale blot of clouds. Thanks for the subway rides, NYC, but I’ll take my bike in Baltimore any day. This entry was posted in bikes, personal and tagged Baltimore, New York City marathon, night riding, subways, winter. Bookmark the permalink. A great story of sister love and how nice it is to come home to the bike and the cats and N.